Ankle sprains often occur as a result of rolling the ankle inwards and causing injury to the ligaments on the outside of the foot and ankle. Often you will have immediate pain and sometimes this will be accompanied by swelling and bruising. It is usually very, very painful!! Ankle sprains are also highly recurrent so getting the correct management and putting into place preventative strategies is key to making sure that you can return to sport, work and hobbies symptom free. 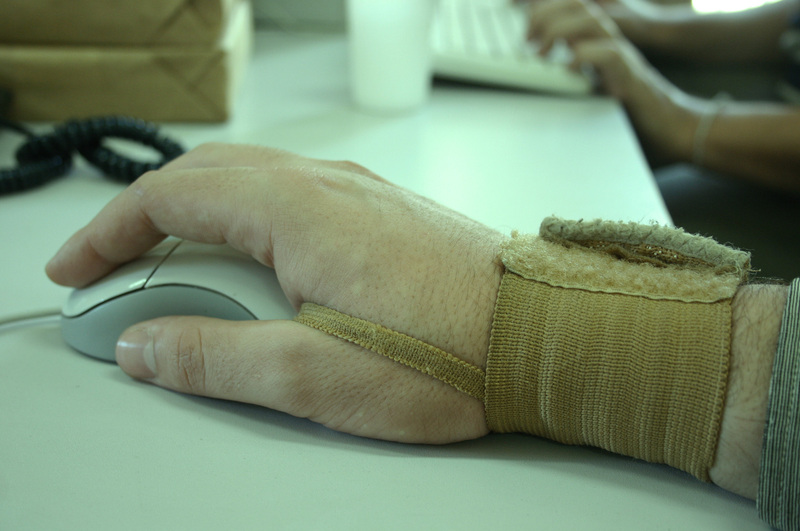 Carpal tunnel syndrome is a common problem seen in physiotherapy. It presents with numbness and tingling in the hand and middle three fingers, weakness of the hand, and can also have associated wrist pain. This is caused by pressure on the median nerve which runs down the length of the arm. It may cause you to wake up through the night or easily drop objects, and is often aggravated by jobs that involve repetitive use or loading of the wrist. There are many fractures that can be difficult to diagnose. Especially ones that occur in small bones or if you have stress fractures (such as a form of shin splints). The team at The Physio Rooms Woodvale are highly skilled in assessing for all musculoskeletal conditions and if we suspect there may be a fracture then we will be sure to refer you onwards for scans and socialist opinion if required. Frozen shoulder is when the shoulder joint becomes very sore and stiff to move. It often happens after an injury or surgery but can also occur with no apparent cause. There is a very definite pattern of stiffness and your shoulder will get worse and then have a period where it plateaus follows by a period of improvement. In our experience, many people who are diagnosed with frozen shoulder have usually developed a very stiff shoulder without it actually becoming “frozen” and with some help from The Physio Rooms Woodvale we can have you back in action in no time. Groin pain can be extremely disabling if you are an active person or have an active role at work. Usually groin pain is a result of a sporting injury but it can also be indicative of problems in the hip joint itself. Expert assessment is required to ensure that you are on the correct treatment pathway from the onset. Our physiotherapists would be happy to help with the diagnosis of your groin pain and get you back to sport and activity as soon as possible. Headaches are a huge burden on anyone who suffers with them with symptoms varying from localised pain to more widespread discomfort that can include the neck, shoulders and jaw. It is important to determine the cause of your headache first to enable to correct treatment plan to be put in place. Our physiotherapists are skilled in assessing headache symptoms and provide treatment where appropriate. Hip bursitis is often felt as pain over the outside of upper thigh. It can be painful when direct pressure is applied to the area or if you are stretching the area by crossing your legs. Often, hip bursitis is accompanied by a gluteal tendon injury and it can be important to determine the exact driver of your symptoms. The team at Physio Rooms Woodvale are experts in assessing and treating bursitis and tendon pain so feel free to give us a call or book in to discuss your case further. Common types of hip pain can include injuries to the hip joint itself or pain associated with bursitis or the gluteal tendons. Common symptoms may include pain in the groin or to the side of the hip and pelvis. You can even feel hip pain in the leg, but it usually doesn’t go past the knee. Often people with pain on the outside of the hip will struggle lying on that side or crossing the affected leg over the midline of the body. This can make it particularly problematic when sleeping as lying on both sides can be painful. Rest assured the team at The Physio Rooms Woodvale are well versed in diagnosing and treating all manner of hip pain ensuring you can be back to your best in no time. Knee pain usually has two types of history. One is of a twist or fall which can result in injuries to the ligaments of the knee. The other is usually a more gradual onset that may have come about due to a change in routine or training. If either of these sounds like you, then head in to The Physio Rooms Woodvale, where our physiotherapists can assess all manner of knee injuries. Once we have a working diagnosis we can provide treatment to reduce pain and get you back to what you love doing most! Low back pain affects over 80% of people at some stage in their lives. It is the number one musculoskeletal complaint and the condition that we see the most on a daily basis. There has been some great research into low back pain over the past few years resulting in a deeper understanding of what might cause and contribute to your pain. Some of that research has shown that scans are rarely needed and that following a physiotherapy program is one of the most effective ways to get back on track with your life. The Physio Rooms Woodvale staff are experts in assessing and treating low back pain and will have you up and running in no time at all. Muscle injuries can be extremely painful and often happen when the load that you place the muscle under exceeds its working capacity. The most common muscle injury is to the hamstrings, but it is not uncommon to experience pain in any muscle group in the body. In the case of a tear, diagnosis is paramount. This will enable us to set timeframes for your return to activity and guide the rehabilitation process. With strains and muscle pain, treatment can usually commence on day one and we would expect symptoms to resolve within a matter of weeks ensuring that you are back to action in no time. Neck pain is the second most common reason why people see their local physiotherapist. If you’ve suffered neck pain, you can probably relate to one of the common causes described below. Whiplash is when the neck suffers direct trauma usually resulting from a traffic accident. Symptoms can be quite unpredictable and commonly come on 24-48 hours after the actual event. Another common reason for neck pain is a sudden turning of the head, for example when checking car mirrors. And finally, simply waking up with a very stiff and sore neck resulting in lots of pain if try to look towards one side. Our physios are skilled in assessing and treating all types of neck pain so if one of the above scenarios sounds like you, don’t hesitate to book an appointment and we can have you back to normal in no time. OA often affects the larger joints of the body such as the knees and hips. It is essentially a reduction in the cartilage between two joint surfaces. OA can’t be reversed but we now have really good evidence to show that if you can strengthen the muscles surrounding a joint which has OA, then outcomes can be very good. Often beginning a strengthening program can be exciting but people regularly stop because they do a little too much and cause a flair up of pain. Our physiotherapists will work closely with you to make sure that you are getting the optimal amount of exercise without flaring up your symptoms. We then progressively increase your exercise to ensure that you are getting stronger and experiencing less pain so that you can enjoy living life to its fullest once more! Persistent pain is highly debilitating and can affect not only the lives of the individual but also family and friends. At The Physio Rooms Woodvale we approach these cases with empathy and like to take the time to understand all of the contributing factors to your pain experience. There have been huge strides in understanding pain in recent years and we are confident that with a structured approach and plan of action we can help you get back to some of the things that you love the most. Some of the common conditions that can contribute to persistent pain include osteoarthritis, fibromyalgia, and chronic fatigue syndrome. However, this list is not exhaustive, and many people never receive an official diagnosis because pain is such a complex experience. But we now know that there are many factors that can contribute to pain and our physiotherapists have the tools to help identify these factors and formulate an effective treatment plan. This condition results in pain under the sole of the foot. Quite often the pain is located towards the heel and can be very tender when direct pressure is applied to the area. It is usually most sore first thing in a morning when you begin to walk but then settles down once you are “warmed up”. Treatment is aimed primarily towards pain relief which can be achieved using certain strapping techniques or orthotics. We then aim to strengthen the region including the calf muscles and foot muscles. Rheumatoid arthritis is classified as an autoimmune disease. This simply means that your body’s immune system has turned against itself. You may notice pain in the hand and feet but sometimes the bigger joints of the body can experience pain first. We work closely with your GP when suspecting Rheumatoid Arthritis as there are specific blood tests that can assist with diagnosis. Management can include exercise-based therapy and manual treatment which the staff at The Physio Rooms Woodvale would love to help you with. Shoulder injuries are very common, and you can bet your bottom dollar that you will have had a friend or relative that has had experience with either a rotator cuff injury or bursitis in the past. Rotator cuff injuries and sensitivity of the bursa (a small fluid filled sack- think of it like a shock absorber) can give you pain and discomfort over the outside of the shoulder and towards the outside of the upper arm. Diagnosis can usually be made through an examination, but scans are sometimes required, especially if you are considering surgery as a potential option. Our physiotherapists are highly skilled in assessing all types of shoulder pain and would love to catch up with you to get you back to sport, work or simply lifting your arm up to hang out the washing! Shin splints, or medial tibial stress syndrome, often presents as a pain running down the inside of the shin bone between the knee and the ankle. It is most commonly related to biomechanical issues at the foot, ankle, knee or hip, or even just poor footwear. Shin splints is generally aggravated by playing a lot of sport, particularly that involve running or repetitive impact. Shin splints also have similar symptoms to stress fractures of the tibia. At The Physio Rooms Woodvale, we can distinguish between the two and give you the best advice for moving forward with your injury. Common areas to experience tendon pain include the Achilles, the shoulder (rotator cuff), the elbow (tennis elbow), the hip, the sole of the foot (plantar fascia) and the patella (knee). Treatment for tendon pain is constantly evolving with new research and our team at The Physio Rooms Woodvale take pride in keeping up to date with these latest developments. The first thing to say about tennis and golfers elbow is that you don’t need to play the sport to have this type of injury! Classically, tennis elbow is soreness over the outside portion of the elbow, often very close to the bony area. Golfer’s elbow is pain on the inside of the elbow and is less common that its counterpart. People will often notice pain and a reduction in grip strength and will often have reduced ability to lift a pan of water or sometimes even a cup of coffee. Physiotherapy is a great option for the treatment of these conditions and with a structured treatment plan, symptoms can be resolved, and we can get you back to tennis, golf or just making a cuppa in no time! TMJ (temporomandibular joint) – or jaw pain, often goes untreated and people are often unaware that physiotherapy can help. TMJ pain is often associated with clicking, headaches, pressure surrounding the jaw, difficulty chewing, and difficulty opening the mouth to it’s full range of movement. This can be caused by jaw injury, grinding or clenching the teeth, stress, or altered biomechanics. Quite often, people with jaw pain also suffer with neck pain as well. Physiotherapy can help with a number of treatment techniques and management strategies. Call us at The Physio Rooms Woodvale to find out more!